The first step in creating a podcast is creating an audio file. Some free web based services like Podomatic allow you to record your audio directly to their servers where it is automatically stored as an mp3 file - the required format for podcasting. This is the simplest method if you only want to podcast a single track of audio. If you want to mix audio from different sources (eg two voices recorded separately, or a voice track with music in the background) you need to use a tool like Audacity, a free open source tool. Once you have your mp3 file(s) recorded, other free web based services like Odeo and GCast allow you to post them to their servers. Creating a simple voice track in Audacity is a straightforward procedure. Make sure you have microphone selected as your source, press the record button and speak. You will notice that Audacity creates a chart of the sound waves you are making as you speak. Make sure these sound waves are approximately as they are in the diagram below. If the line is too 'flat'; the volume is too low. If the sound waves are peaking (ie running off the graph above and below) the volume is too loud. Note that the two tracks each have their own volume control. Play both tracks through balancing the volume until you have it just right. You are now ready to mix the two tracks down into one mp3 file. Note: when you hit the play button the two tracks now play one after the other! 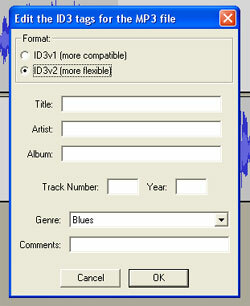 You are now ready to mix the two tracks into one mp3 file. It's up to you whether or not you fill it in. If you do it will appear nicely named and listed in your Media Player when you eventually play the file. One way or another you have to get it onto the Internet somewhere. Podomatic (see an intro to using Podomatic), Odeo and GCast all offer this service for free. This is the simplest option. Once you have uploaded the file into one of these free services you'll notice that all of them automatically create an RSS feed for your mp3 file (your podcast in effect) so that it can be found by an RSS aggregator. (Look for the RSS button, right mouse click on it, and copy the link location or shortcut.) There are web based aggregators like Juice, but in fact most Media Players like Windows Media Player and iTunes can function as RSS aggregators. Let's look at iTunes. If you have an iPod, and you're using iTunes as your aggregator, this is really easy. 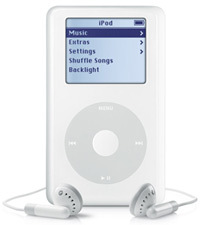 On the preferences tab in iTunes there is a further tab - iPod. Select it and follow the instructions.